Have you ever heard “All my kids want to do is play video games” phrased as a complaint? Well, the adults in our family do all of our work – and most of our recreation – via laptop and phone. My 80-something-year-old mom keeps up with friends and reading via her iPad. You don’t limit your kids’ screen time. We don’t limit Sarah’s, other than as part of some general family “things,” like not using our phones during dinner, that we all do. This has opened us up to a lot of criticism, and I’m sure if you’re a non-limit family, you’ve gotten that too. I’ll share some discussion points that worked to reduce that for us, and hopefully you’ll find those helpful as well. You DO limit your kids’ screen time. We don’t, but that’s OK! I told my friend Judy in a comment the other week that our decision is the right one for our family right now. If I had 5 kids? If Sarah were 7? If I didn’t need to be on my computer 10 hours a day to do my various jobs? I don’t know. If you do have limits, though, I encourage you to take them out every so often and re-evaluate. Is what you’re doing still working for your family? Do age, interest or social needs change them? I hope this series will help you ask – and answer – those questions. You’re trying to decide if you should limit your kids’ screen time, but aren’t sure what makes the most sense. Please, whatever you do, don’t set different limits for “educational” and “non-educational” games. That’s about the only thing I have a hard time supporting. But, as I mentioned, we’ll walk through the ways video games have helped us on our homeschooling journey, and whatever limits (or not) you end up with, you’ll be able to see what good stuff is coming from the screen time you allow! If you think, “All my kids would do is play video games!” when you hear someone talk about unschooling and child-led learning, you’re not alone. When we talk about our unschooling approach, in which Sarah is not “required” by us to do anything, but rather we help her discover the things she’s most interested in, this is the response we most often hear. It might be true. But from talking with unschoolers (and relaxed homeschoolers) across the country, I find that it’s generally not. If I ignored my daughter for 18 hours straight, she would probably play video games or apps for about 10 of them. In good news, I don’t (ignore her, that is), and if you’re interested in reading this homeschooling blog, you probably aren’t the type to ignore your kids. When you’re engaged as a family, no one routinely plays video games for 10 hours or more straight. Honest. You want video games to be a tool in your arsenal, not a master. That’s my end goal for this series. Maybe your kids have a half-hour a day of screen time. Maybe there are days where they’re in front of a device of some sort for 8 hours. Either way, that time is important. By Friday, I’m hoping to give you several concrete ways to be intentional and purposeful about video games in your family – and share some of the awesome benefits we’ve seen in our own family’s learning journey. That’s how you’ll level up your family’s homeschool – through this or any other series. By thinking about what your needs are, by picking the parts that work for you, and by being willing to let go of whatever isn’t working. I can’t wait to help you “level up” like that! 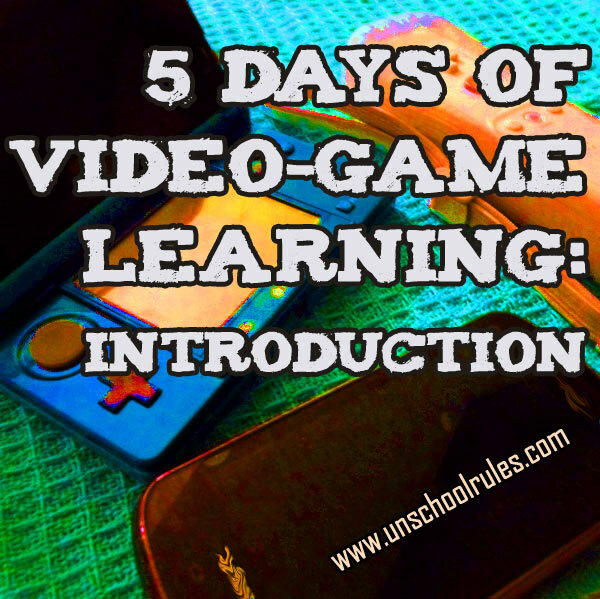 This entry is about unschooling, video games. The previous post was To the moon and back: Best resources for space and solar-system study. The next post is Virtual friends, virtual art: Video games for social skills and creativity. Looking forward to reading them Joan. I don’t limit Keilee’s ‘anything’ really. She has never been a fan of video games which just kills her gamer geek Mom! I had to stop playing online games because the people I played with were psycho players. Which was fine pre Keilee but not so much now. 🙂 Can’t wait to see what you have to say. I am looking forward to reading this series, too! I have struggled with it in the past, but I have settled to a place where I do not limit the girls screen time. I will occasionally strongly suggest that they should really get up and move around for a bit after a watching spree…and once they get up and find something else to do they are glad they did 😉 Truly, I have found that if I go with what the girls want to watch and how they want to spend their time, they are inspired by their watching and playing with apps and so forth to go on and do other things and be creative. I just don’t see the point of limiting it strictly to certain times or amounts…they are using what they are watching and playing to learn, one way or another! Um, ok, this blog title caught the eye of my younger son ( 8 years old ) as I was reading your other blog post about night owl homeschooling. I promised him we would read it when I was done sharing your night owl post, so here we are. I just have to say I feel like I want to just sit and read your entire blog from day one til now because I am in such agreement with how you do things in your household in your homeschool! My husband and I are huge gamers, but we have done many of the games as a family so we really rather find it to be part of our family time as much as going to the park, riding bikes, camping, etc. Kori, you guys are MORE than welcome to read everything 🙂 I’d love it!! I am so much in agreement. We are big family gamers and we enjoy it just as much as we do going to the movies, taking trips, reading, anything else. Mecca, so nice to meet you! I’m so glad you found us too!